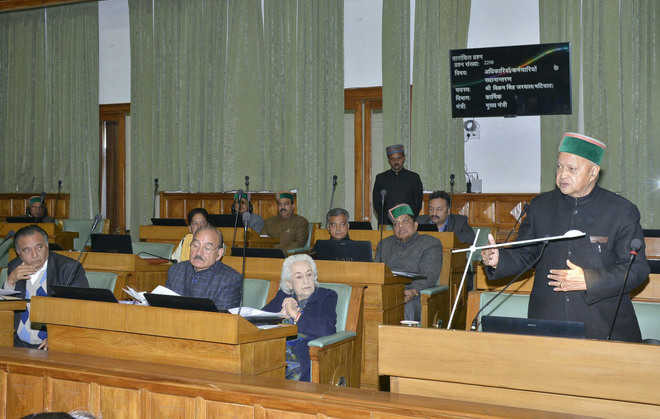 Shimla: Chief Minister Virbhadra Singh and the Urban Development Minister assured residents of merged areas led by members of the Upnagriya Jan Kalyan Samanvay Samiti (UJKSS) that the government would consider their demand for “one-time relaxation in compounding fee”. The UJKSS delegation led by Kasumpati legislator Anirudh Singh met the Chief Minister and the minister in the Vidhan Sabha complex and pleaded the case of the house owners of the merged areas and Special Development Authority Areas (SADA). Accompanied by UJKSS’s president Chandrapaul Mehta, secretary Govind Chatranta, Bhupender Kanwar and others requested the Chief Minster to accept the residents’ demand. In a 13-page memorandum submitted to Virbhadra, Mehta and Chatranta stated that the TCP Bill would benefit only builders while the actual targeted house owners would be left in the lurch. They referred to a recent study declaring 44 big government buildings unsafe as these have been constructed in violation of the MC bylaws. The residents are being made to pay through the nose by charging them hefty compounding fee. They also referred to the Nanavati commission report on the regularisation of illegal houses in the country as these catered to the housing needs of the people in urban areas . “We request the government to waive compounding fee or penalty as proposed in the TCP Bill- 2017 as a one-time relaxation,” the residents said.